Our mission is to unite and inspire diverse young people to become confident and courageous leaders committed to community transformation. If you want to help us build a community of young leaders who are empowered to reach across racial and socio-economic divides, prepared for secondary educational opportunities and careers, and civically engaged in their communities, you’ve come to the right place. BRIDGES strives for a workplace that is diverse and inclusive. We encourage qualified individuals of all backgrounds to apply, including people of color, immigrants, refugees, women, LGBTQ individuals, people with disabilities, and veterans. 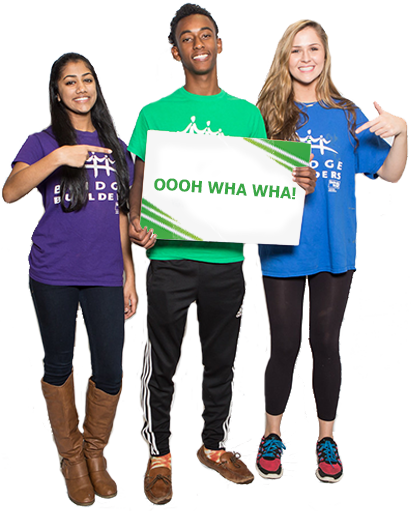 The Director of Communications provides strategic leadership in managing and executing all aspects of communications, including marketing, public relations, branding, and web/digital presence, in support of BRIDGES’ mission. The ideal candidate excels in messaging strategy and expanding audience reach, is results-oriented, and has strong project management and collaboration skills. The ideal candidate also cares deeply about the mission of BRIDGES and is gifted at gathering and telling stories relating to our work. Click the position title above to view the full job description. To apply, submit a resume and cover letter to careers@bridgesusa.org with the subject header “Director of Communications.” No calls, please. The primary responsibility of the Donor Relations Specialist is to create, document and implement a comprehensive donor relations plan to attract new donors, steward current donors, and support and celebrate all donors that support the mission of BRIDGES. The Donor Relations Specialist will work with the development team to plan, organize, and implement events related to annual fundraising, Bridge Builders alumni fundraising, and special campaigns. Click the position title above to view the full job description. To apply, submit a resume and cover letter to careers@bridgesusa.org with the subject header “Donor Relations Specialist.” No calls, please. For internships, AmeriCorps service, and summer positions, click here.